Add the cubed squash to a cookie sheet and toss with olive oil, salt and pepper. Bake squash at 400° for 20-30 minutes, depending on how caramelized you like your squash. 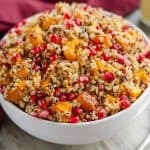 Toss the squash along with the cooked quinoa, pomegranate seeds and Apple Cider Vinaigrette into a medium bowl. Stir until everything is well coated. Serve warm or chilled.